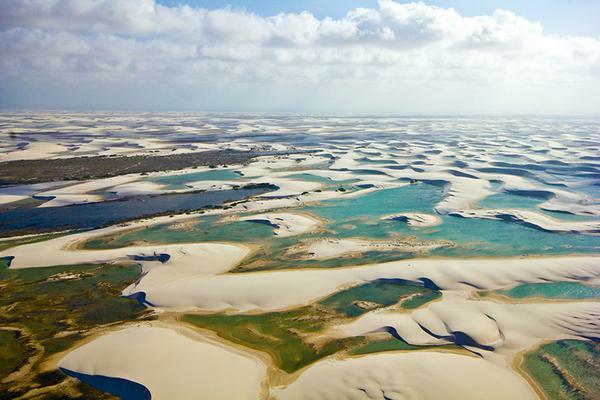 Lençóis Maranhenses National Park in Brazil is one of the most spectacular landscapes I have ever seen; I could photograph it for days on end. 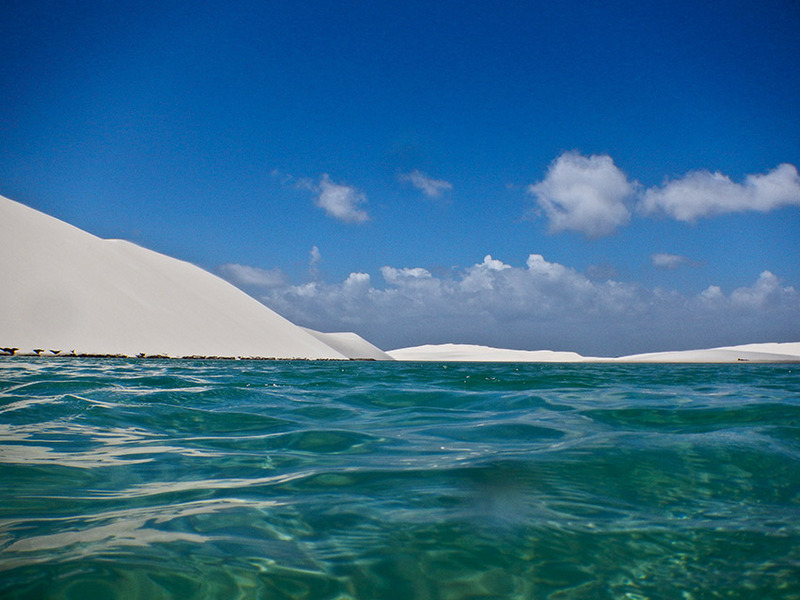 Perfectly shaped white sand dunes filled with crystal-clear fresh water as far as the eye can see. It’s hard to believe—and almost seems out of this world—but this natural landscape is real and is waiting for you to visit. 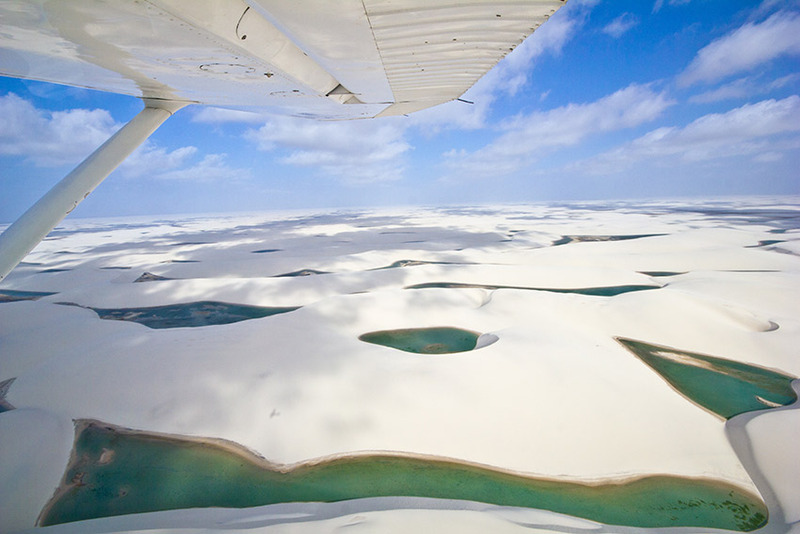 Lençóis Maranhenses National Park from the air. During a month-long journey through Northeast Brazil I kept hearing rumours of a remote coastal region near Jericoacoa, a little-known national park with the draw of a surreal natural phenomenon. The park is a small spit of land that, over hundreds of years of erosion, has morphed into sweeping sand dunes giving it the appearance of a miniature desert. But it’s not a desert at all. This fact becomes immediately apparent when you see the vast amounts of fresh water puddled in between the dunes. Fresh water pooled in sand dunes is a sight to behold. Walking around this landscape you feel like you’re dreaming. It’s truly a wonder of nature. 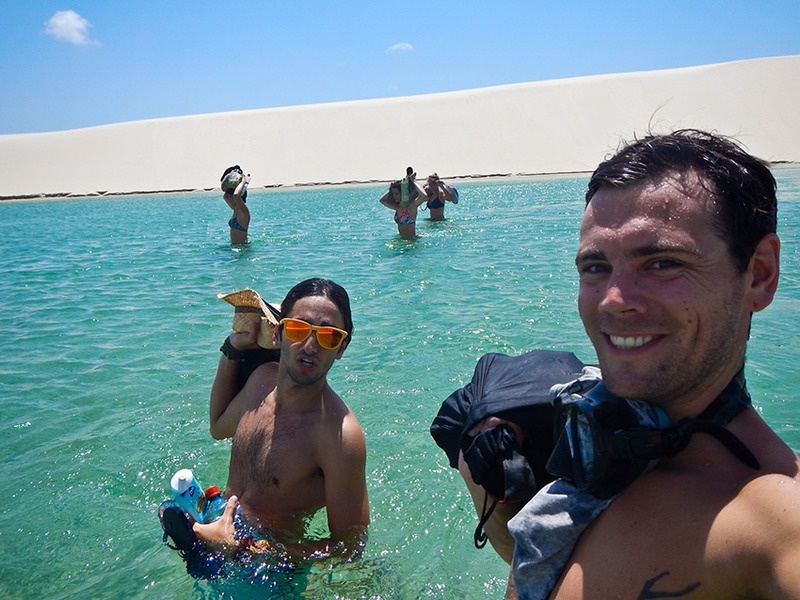 The pools are created by the annual rains carried from the nearby Amazon River, and inland wetlands. The rainfall sweeps across the sand dunes and rolls down and collects into the basins being filtered as it goes leaving amazingly clear fresh water in its wake. This collection of rain water is really quite normal, but the fact it happens over sand dunes makes it unique. Playing around on the dunes. 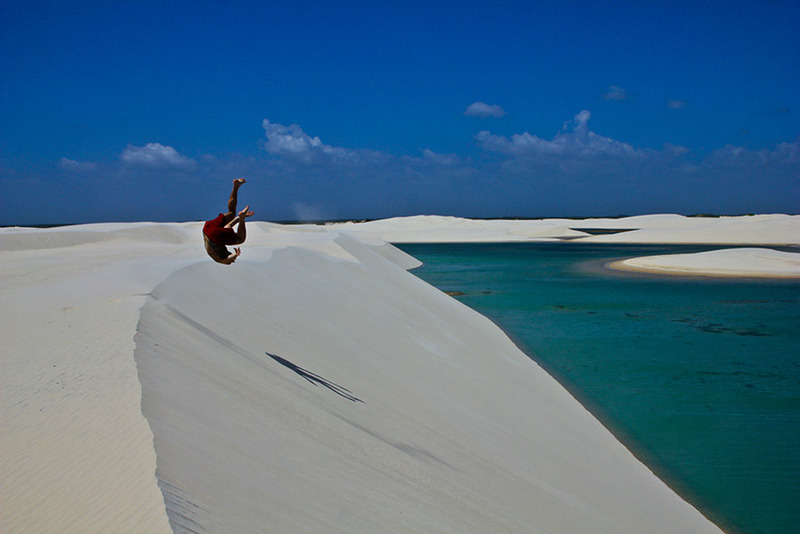 Lençóis Maranhenses National Park is still relatively unknown. This is probably because of its remoteness and relative inaccessibility; it could also be due to the location being in a less popular part of Brazil than say Iguazu Falls or Rio de Janeiro. The national park has a somewhat harsh environment with little wildlife, flora or fauna. There is a sparsely populated village nearby called Atins, with a couple of options for accommodation and food, and also a small town about 20km (12 mi) inland and upriver from Atins called Barreirinhas. This is where you will need to go to hop on a scenic aerial flight over the park. The flights are amazing and highly recommended. Taking a scenic flight is highly recommended. Right now it is also possible to access the park by foot. This is amazing because you can explore the dunes and slowly make your way through the maze of sand and water, up and down, from one pool to the next. You can swim in the pools and even have a picnic if you want. It is such a treat to be able to access this amazing park almost all to yourself. The desolated and sparse landscape gives the impression that it’s from another world. One of the pools from the surface. 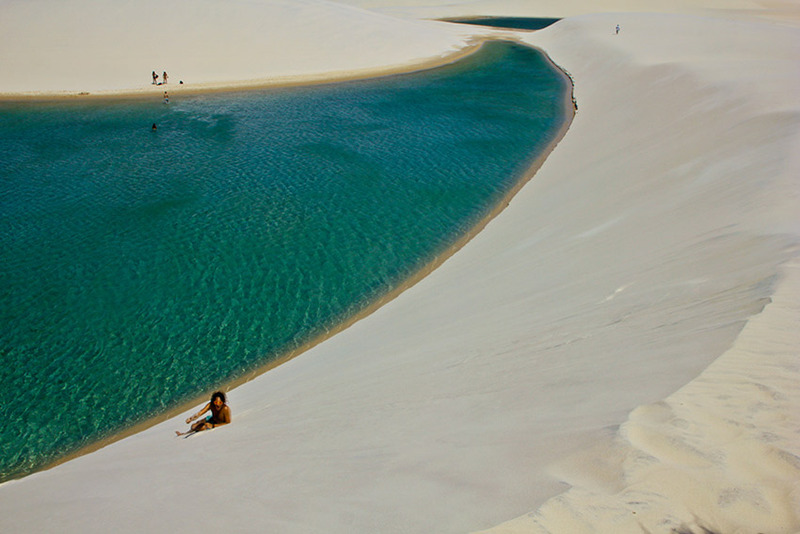 Lençóis Maranhenses is one of the places that makes travel an exploration of one’s imagination. It’s the ‘lost world’, the Shangri-la, the unimaginable beauty this planet tries to keep secret, except for the ambitious traveller to enjoy. G Adventures runs a number of departures in Brazil encompassing a wide range of departure dates and activities to cater for different tastes. We’re thrilled at the prospect of showing you this big blue planet of ours — check out our small group trips here. The cliffs of Svalbard stand steadfast under a canopy of rolling clouds.